January! The time of new beginnings, resolutions, recovery from the holidays and, apparently, polar vortices. This month, nearly over, has been a whirlwind in my little corner of the world. We didn’t arrive home from our holiday travel until a few days into January, which left me feeling like the year had started when I wasn’t quite paying attention. I’ve traveled two of the last three weekends, visiting Seattle and Austin for work events. I love both cities, and the work and interspersed exploration have been inspiring. But my senses are overwhelmed, and I can feel the tug back toward routine and staying in. Whilst traveling and trying to keep all of the balls in the air—work, life, etc.—my thoughts about the year ahead and unanswered questions about the future have hummed in the background, persistent, like a white noise machine, except that they keep me up rather than lulling me to sleep. Somewhere in there, I also had a birthday, so I am thinking not only about 2019 but about being 32—what does that mean, and what do I want? I’ve always been an old soul, more easily connecting with friends a few years my senior, appealing to friends’ parents and bosses as mature, more serious and risk averse than my age might suggest. What happens to an old soul as the body catches up? I’m finding myself slightly envious of my friends and coworkers in their twenties these days; in retrospect, I see how everything carries just a bit less weight. Yet I know I’m not the only one who missed that memo, and I can’t help but wonder if I’ll think the exact same thing in 10 years more. Maybe I’ll give up resolutions someday, but for now, the process of taking stock and being intentional about what’s ahead works for me. My resolutions include little things I want to do, like master cacio e pepe and visit the library more. I always have at least one resolution that reads more like a mantra than a goal: open heart, says the top of my list this year. And in this practice of reflecting and resolving, I also try to acknowledge the healthy patterns and practices I have already: going to yoga and baking and running and reading books and diving deep in relationships. Because it’s all a balance, isn’t it? Resolving to grow in the year ahead while celebrating the lives we’ve built. Taking things seriously while holding them loosely. Embracing whatever chaos might come but reaching for equilibrium when we can. Asking the big questions but remembering that we have some answers already; we aren’t just lost at sea. This week, I’m seeking that balance in small ways. The questions might be big, but the helpful everyday habits, it turns out, are small. For me, yoga and evening cups of tea and reaching for my journal and green smoothies are easy ways to sink back into my bones, to feel present in the moment and hopeful for the future. 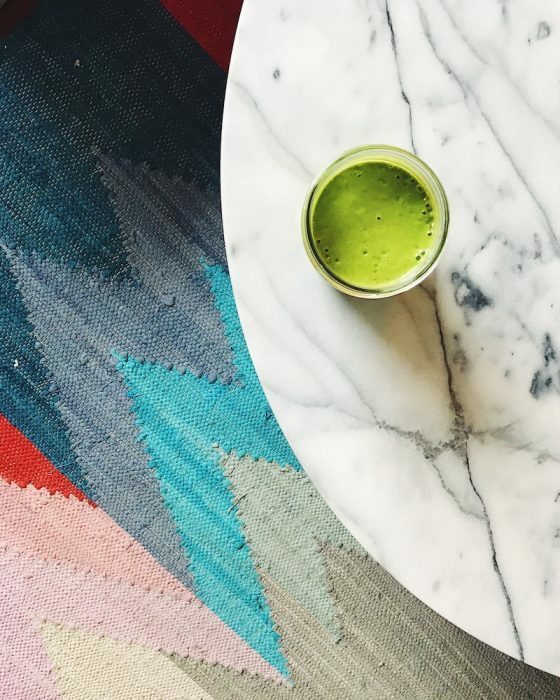 I realized that I’ve never shared my favorite smoothie formula here, and while I know it’s WAY UNDER ZERO degrees in much of the country, I often find freshness welcome in winter, waking up my insides and helping me feel lighter. (Disclaimer: I live in California.) I also think a smoothie is quite excellent alongside something warm—the pairing of bitter coffee and a just slightly sweet smoothie is under-celebrated, if you ask me. So here’s my go-to formula, with a few adjustments and options for tweaking. If you’re into smoothies, I’d love to hear your favorite combinations! And if you have tried-and-true ways to keep your balance, I’d love to hear those, too. Key to a great smoothie is finding the texture/thickness and sweetness that you prefer. You can, of course, toss all sorts of sneaky healthful things in once you have the formula that you like. This is mine. I should also note that I have a Vitamix, which was given to me several years ago by a friend with the useful hookup of working at a large food company. But now I am extremely attached. It makes the smoothest smoothies and silkiest soups. 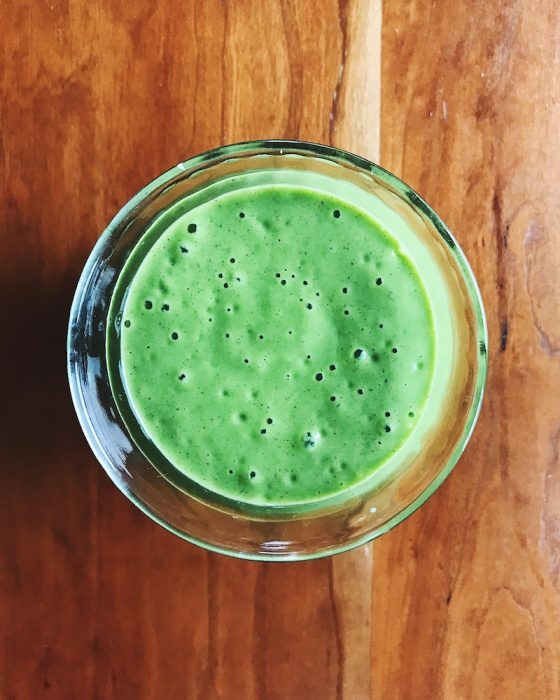 If you have a not-so-high-powered blender, stick to spinach rather than a thicker, tougher green like kale. Put the greens, banana, date, almond butter, cinnamon, salt and, if using, mango, flax seeds, yogurt and/or ginger in a high-powered blender. Add most of the water (coconut or filtered) and a couple of ice cubes and start the blender. Blend on high speed for a minute or two, tamping down the contents if necessary. Depending on your desired thickness, add more liquid and/or ice. Blend again, until very smooth. Pour into a glass and enjoy!